15 Aug The good times are here (for prices). This week has been amazing. The market has blown its top and shot through the $400 barrier (ASX), all areas of Australia are receiving good prices. I also give a view on the strange decision by a Brazilian judge to ban glyphosate. In Figure 1, we can see the ASX and Chicago futures for our coming harvest in A$/mt. 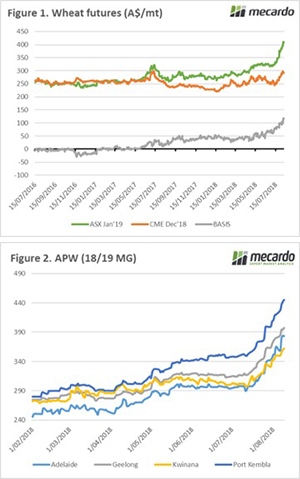 There has been a rise in both contracts, however, ASX has seen a much larger jump. This is because of the deteriorating conditions within Australia. We now have a basis level between ASX and CBOT approaching A$120/mt. This is a massive premium over Chicago, highlighting the concerns relating to the availability of feed. The physical prices have also been on a stratospheric rise in the past month. It remains a catch-22 for many, with high prices and next to no crop to sell. There are however areas which are set to achieve very good returns, such as parts of Vic, WA and SA. In some interesting political news, a Brazilian judge has banned the use of the herbicide glyphosate. As many will be aware, Brazil grows a power of soybeans, of which, a huge proportion are roundup ready. We have however seen decisions by judges in Brazil to ban an industry (Live-ex, Feb’18), only to be overturned very shortly after. I expect that this will be overturned within the week. It is a case of waiting and hoping for rain. Unfortunately, it is likely too late for those in northern NSW/southern QLD. There is a WASDE report due out overnight. We will see reductions in Australia, Russia and the EU. Will this surprise anyone in the trade?